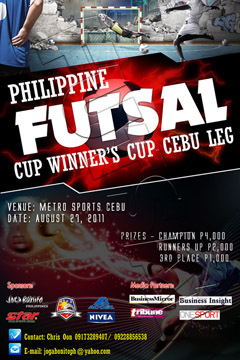 THE FIRST YEAR-LONG FUTSAL TOURNAMENT IN THE PHILIPPINES. wherein the Champions represents their Province in the National Finals in December. For Inquiries: Text your Team, Name & Email ad to # 0922-802.22.76. There will be 10 Elimination Legs every month (8AM-6PM). 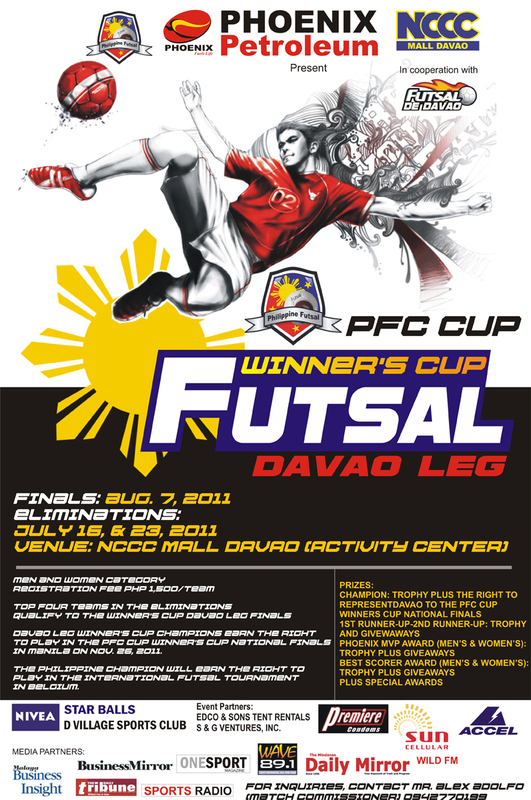 Only the Leg Champions will advance to the PILIPINAS FUTSAL CUP WINNERS CUP NATIONAL FINALS on November 26-27, 2011 at THE VILLAGE SPORTS CLUB. 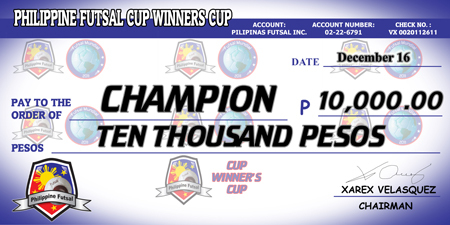 Wherein the Champion wins Cash price& Pilipinas Futsal Products. 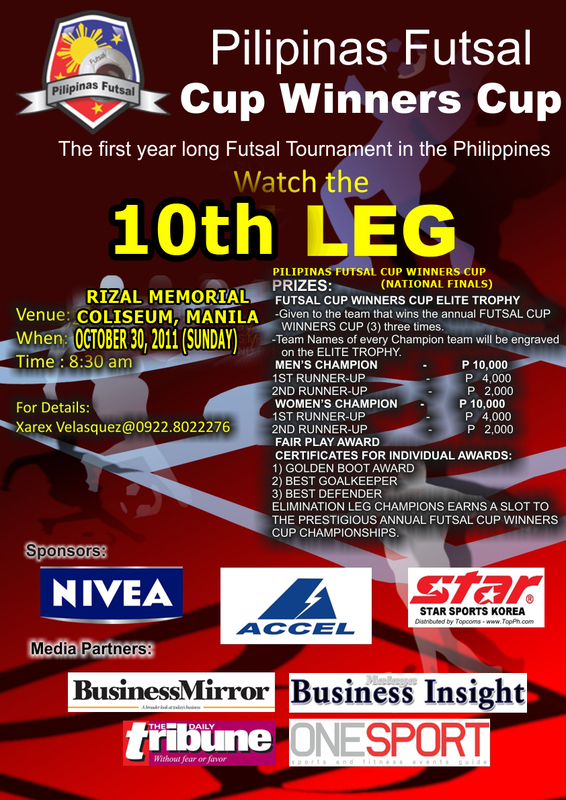 Only the 10 Men’s Leg winners & 10 Women’s Leg winners qualify. TEAMS CAN PLAY IN EVERY LEG. (If there are team slots available). AS LONG AS THEY HAVE NOT WON A LEG YET. Players of a leg champion team cannot play anymore in the succeeding elimination legs. Eligible Male Players for PFCWC must not be playing on 1st Division Tournaments for over a year. (ex. UFL, NCAA, UAAP, SUZUKI CUP, NATIONAL FINALS,). No restriction for female players. But a team should only have 1 female player from the National Team. 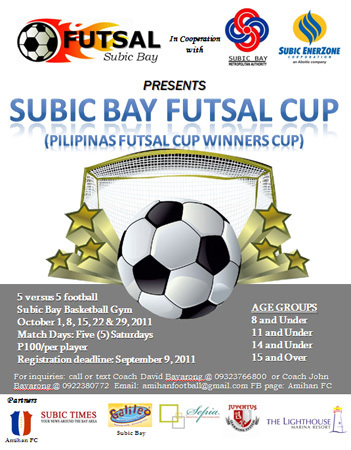 We have an invitation that the Champion Team of the PFCWC can represent the Philippines in a tournament in Belgium.